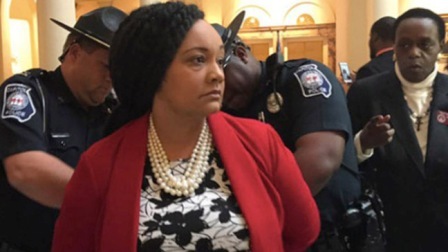 A Georgia state senator who was arrested Tuesday during a protest at the state Capitol building said she was “singled out” by police “as a Black female senator” standing with her constituents. Democratic state Sen. Nikema Williams was one of at least 15 people who were arrested at a Black Lives Matter demonstration in the Capitol building demanding that “every vote” be counted from last week’s gubernatorial election. Ms. Williams was handcuffed while a special session of the General Assembly was underway. She was charged with misdemeanor obstruction of justice and spent about six hours at Fulton County Jail in Atlanta, HuffPost reported. The Georgia State Patrol said the protesters were arrested by Capitol Police for disrupting the orderly conduct of official business. “I showed up at the Capitol today for a special session to take care of the citizens of Georgia,” Ms. Williams said in a statement after her release. “I saw I had constituents protesting for their voices to be heard. There are countless Georgians who cast their ballots and still don’t feel like their voices are heard. I joined them down on the floor, and I was singled out as a Black female senator standing in the rotunda with constituents. “I’m incredibly proud and will continue to stand with the citizens of Georgia to demand that their votes be counted,” she added.